Family Law Attorney Rachel DeGraba Joins Firm. 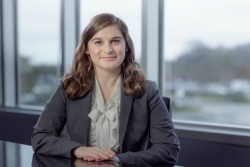 Richmond, VA, March 18, 2019 --(PR.com)-- Owen and Owens PLC is pleased to announce that Rachel DeGraba has joined the firm’s expanding Family Law Practice group. Originally from Chester, VA, DeGraba graduated from Thomas Dale High School, received her B.A. from James Madison University and her J.D. from University of Richmond, school of law. DeGraba handles all types of Family Law matters including divorce, child custody, visitation, child support, spousal support, property settlement agreements, prenuptial agreements and adoptions. She is a member of the Richmond Bar Association, Metro Women’s Bar Association, Chesterfield Bar Association, Chesterfield Chamber of Commerce and the Virginia Trial Lawyer’s Association. The attorneys of Owen and Owens are committed to helping people through the most difficult and challenging situations of their lives with legal expertise combined with a caring attitude towards everyone they represent. The firm has many practices areas with major categories of representation including: Family Law, Personal representation and Commercial representation. Please contact Mary Owens @ (804) 594-1911 for more information.